AbleFitness Power Tower Review – Is It Worth Your Money? Still haven’t found the right power tower for you? Well, fear not, my friend! I’m sure that sooner or later you will find “the one”. Maybe it is AbleFitness power tower, about which I’m going to write a review right now. AbleFitness is not very well known, but they do make all kinds of fitness equipment, ranging from doorway chin-ups, gym rings, mounted pull-up bars, resistance bands and yes, power towers. So we will take a closer look at the very first produced one. The entire frame is made of sturdy steel and it comes with ergonomic design. The weight capacity of the tower is 330 lbs (149.7 kg). 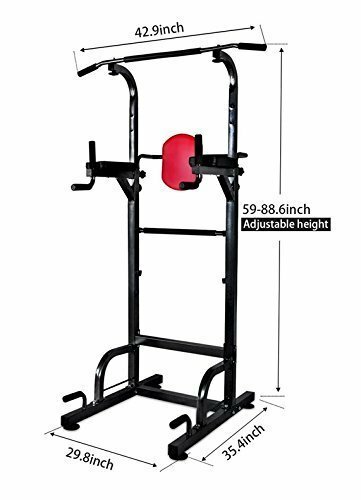 The power tower includes chin-up / pull-up bar, arms support, backrest, single parallel bars, dip station and push up bars. The height is adjustable from 59 inches (149.9 cm) to 88.6 inches (225 cm). The total weight is 62 pounds (28.1 kg). According to my buddy, the power tower came in one box, very well packed. Now regarding the assembly, he suggested to have a buddy to help you out. It might prove difficult to assemble it on your own. The AbleFitness power tower is quite stable under my weight of 160 lbs (placed on the flat linoleum floor). The tower, despite the base being narrow and not wide, did not wobble. But I can imagine that it WILL wobble under heavier weight, but this can be solved by adding some heavy-weight at the back base of the tower. The dip station is quite standard, I’d say. The armrests are large enough to support heavy arms and thanks to the cushioned surface are quite comfortable. The bars themselves could be a bit thicket, but I’ve seen thinner, so all good here. Also, note that armrests are not adjustable. The backrest itself could be a bit larger for my own preferences, but it does the job and is sturdy, yet still comfortable on the back. If you want to do knee raises here, you should not experience any problems. Regarding the adjustable height and the pull-up / chin-up bar itself, they work really well. The bar’s length is 42.9 inches (109), which is pretty standard. The max weight of 88.6 inches is good enough even for taller guys. You can do pull-ups, chin-ups and if the back base of the tower is weighted, you can even try muscle ups. The bar itself is padded in the middle and on the angled edges for a comfortable grip. The last but not least, the push-up bars at the base are most welcome, indeed. While some one of you would prefer to have a sit-up bar there, I think push-up bars are a great addition as well, not to mention that angled push-ups really build up your core strength. Well, I guess that’s all she wrote about AbleFitness power tower. I can safely say that AbleFitness power tower is worth the money and the name. If you do not mind putting some weight at the far base, then I’d say to try it out. It is a good piece of fitness equipment and deserves a spot in your home gym.